We absolutely love working with our book printer, Signature Book Printing, and once in a while, a friend or colleague decides to give them a try too. I recently received a review copy of a new knitting book by Gina House, which she self-published via Kickstarter and Signature Book Printing. I thought it would be fun to do a little interview, so here we go! JJ: When and how did you first get the idea for your book Wonderlace? 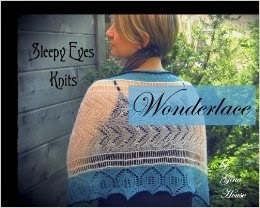 GH: I think I got the idea for Wonderlace even before I was finished with writing my first book, Dreamscape! (I tend to get very excited about something new before I've finished what I'm working on...whoops!) But, seriously, I think I decided to have a collection of lace designs because lace is my FAVORITE kind of project to knit. I love how magical lace is to knit - lace is challenging, interesting and the entire blocking process is like unwrapping a gift. When the lace is finally pinned out, you get this feeling like, "Omg...I really knit this beautiful piece. I am so proud of myself." JJ: What was the most enjoyable part of the creative process for you? GH: The most enjoyable part of the creative process is envisioning the knits I want to design. Once I get a single idea in my head, that idea bubbles up into an overwhelming number ideas that I can't even keep up. This is how it feels every time I want to start a new collection of designs. A number of my ideas haven't worked out (and sometimes I get teary over designs that I had to let go of), but I kept the 13 that were my favorites. I'm pretty happy with them :) To be honest, though, at times I've created a design that, years later, I look at and say to myself, "What the heck was I thinking?! Ugh!" I also love, love taking photographs of my knitwear designs. I'm not a professional photographer by any means, but I do have fun with it. I am super lucky to have such amazing (and attractive! lol) friends that agreed to model for me (90% of them are knitters!) for this book...and my first book, too. My favorite model is one of my best friends, Jackie, and she is the model for most of my designs. We make a great team because modeling comes naturally to her and we know each other so well. I tell her where to stand, drape a knit on her and say, "Okay, do your stuff." And she does! JJ: I was so happy to hear that you are working with our book printer, Signature Book Printing. What was it like to work with them? JJ: What was the most challenging part of the process of creating this book? GH: *sigh* Well, the most challenging part (aka pain in the you-know-what) had to have been the chart making process and creating the book's page set up. 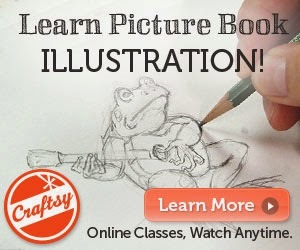 There is SOOO much more to creating a book than most people think. When the book needs to be printed in a certain format (with very precise margins and all of that), it's very intimidating. Especially if you're new to the software. Dreamscape was created using Microsoft Word and, this time, I used Apple's Pages. Every time I create a book, I seem to have a new word processing system to learn, so it takes a while. Luckily, my husband Ian is a computer geek, so he helped me to figure things out here and there. But, it took months to put all of my finished designs, charts, photographs and clip art into the book. I wanted it to look a certain way (like a fairytale story book) and I didn't want to rush. I was happy with the end result. JJ: Which is your favorite design from this book and why? 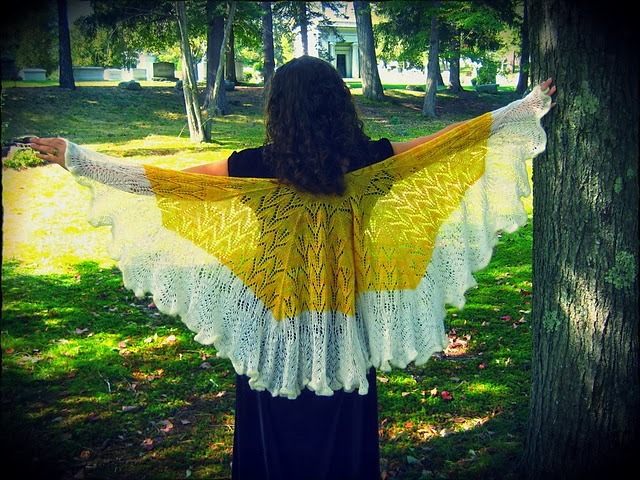 GH: My favorite design from the book has to be the Dreams of Alice Shawlette. It looks complicated, but it really isn't. 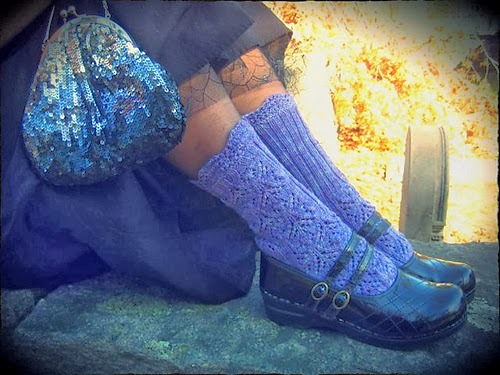 The center is knit flat and then the lace border is picked up on either side. 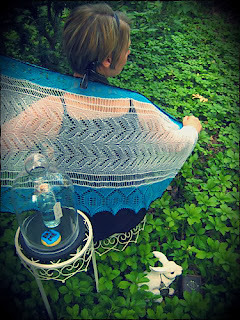 All of the lace patterns in this shawl are interesting, but doable. I think I also love this one because I love the yarn and the finished shawl feels like a feather...so light and airy. I was very happy knitting on this one. It's funny because my close friend, Heather, modeled for this design and all I told her was that she should come over wearing a black dress and black dress shoes. She had no idea that she'd be modeling a shawl...AND next to the pool shed at my house! She was such a good sport...kneeling right in the damp soil or sitting precariously on the metal table I had placed in the low shrubbery. My husband was perched on a ladder with a white parasol (as a filter) to keep out the sun. My neighbors must have thought I was nuts! lol. The pictures came out lovely, though. We were both happy with the results and that's one of reasons why I chose this design for the cover. JJ: Tell us a little about your book signings and the events you are planning for this new book. GH: So far, since September of this year, I've had 5 book signings/trunk shows on the East Coast. Mostly, in New England. I have 4+ more scheduled from now until the end of the year. It's fun, but exhausting. It's hard to sell yourself. You want to be proud of your designs and get people to be as excited as you are, but you don't want to shove your book down their throat. Especially with lace. Once knitters see that the book is all lace designs (even though I have beginner lace to challenging and using many different weights of yarn), they always say, "Oh, no, I could never knit lace. I'm not good enough." I can't tell you how frustrating it is...because I know they COULD do it! I felt the same way at first, but it's like riding a bike or driving a car...the more you practice, the better you get at it. And, really, lace is mostly just decreases and yarn overs, right? I want to encourage knitters to try lace - just a little - because I want them to love it like I do. That's why I created the Water Nymph Washcloth, the Hunter Scarf and the La Bete Pillows designs...all beginner lace. Interesting, but not so difficult that you want to strangle yourself with your yarn. I love all of the yarn stores that I've visited so far. The owners have been super nice to me and really making me feel like my book is Something Special. I always try to go to the Elegant Ewe in Concord, NH because that's one of my favorite local yarn stores. They've supported me from the very beginning with Dreamscape and I couldn't be more grateful. I love visiting the store and the people who work there would do anything to help you. Plus, their yarn is awe-some! I was also asked to go to the Shenandoah Fiber Festival this year in Berryville, VA and I had the BEST time there. The festival was amazing (as well as the cherry crumble! mmmm) and I feel like I made a lot of friends. I hated to leave...I was having so much fun. I hope I can go again next year. I'm also trying to get the word out to podcasters and bloggers about my book for reviews and such. I get overwhelmed with the amount of work that goes into advertising myself and my book and I wish I had an assistant! lol. I have three part time jobs (I work at an acupuncture clinic, I teach archery, hula hooping and I used to teach yoga & knitting, too) and I'm also a stay-at-home mom when I'm not working or designing. I only have one son at home now (he's 11 and a cutie pie), now that my oldest is in college (he's finishing his junior year! omg). There is always a lot to do and not that much time to do it. If anyone out there is interested in reviewing my book, please let me know and I'll send you a book (and a huge hug!). When you asked me to do an interview with you, I was jumping up and down in my kitchen and ran outside to tell my husband. He thought I was slightly crazy, but he was happy for me nonetheless :D Yay! JJ: What are you working on next? I also wanted to share that I have a free app on iTunes called "SleepyEyes". There are over 15 free patterns to download and you can buy both of my books through the app, as well. There's a search section and a yarn/needle gauge chart, too. My husband created it for me and I think it's pretty fun. Joanna, thank you so much for interviewing me. I'm really grateful for this opportunity. You are one of my favorite designers and you truly inspired me to finish Wonderlace, after seeing and buying your beautiful books. 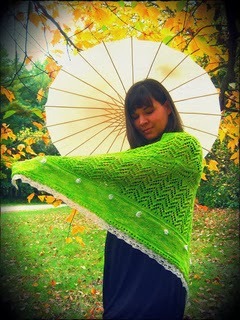 I can't wait to get my hands on your new book, "Green Gable Knits"! I hope we can meet one day and spend the afternoon knitting together. 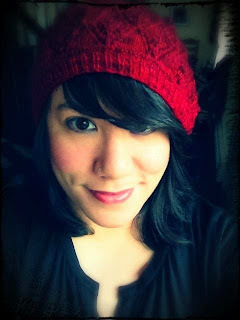 There are lots of ways to stay connected with Gina and her work! Here they are! You are so welcome, Gina! Best wishes! !